US Markets were closed on Monday for Martin Luther King’s Birthday, but it didn’t stop SPX futures from gapping up, and then making another all-time high. The mood was not however shared elsewhere as NKY and DAX were flat, and FTSE was slightly down, reacting to GBP adding to Friday’s huge 2-cent gain, touching $1.38 for the first time since Brexit. USD was sharply down again, with DXY closing at a three-year low of $90.45, and all currencies, Gold and Oil were up in line, the latter making another three-year high. US 10-year bond yields spiked up briefly but closed the day flat. Tuesday was a rare down day in the US markets. After an initial further intraday high, mainly pre-session, which saw the DJIA push through 26,000 for the first time, before falling 1.45% (SPX fell 1.40%) during the cash period. It is possible that this was on government shutdown concerns, although with SPX and DJIA so overbought, it is difficult to say. DAX and FTSE fell in line, as did NKY although a strong performance in the Asian session meant the Japanese index ended the day flat. For once DXY was slightly up (as were bond yields), due to slight gains against CAD and EUR, and small losses against GBP and JPY. AUD was flat. Gold spiked briefly as equities fell, but ended the day down as did Oil. The stock rally continued on Wednesday, erasing Tuesday’s losses and SPX and DJIA made new record closing highs and new roundpoints of 2,800 and 26,000 respectively. It was less than two weeks ago that the DJIA passed 25,000, making this the fastest 1,000 points in history. NKY followed suit almost exactly (the index is back to tracking USDJPY this week), but DAX and FTSE were flat on the day. 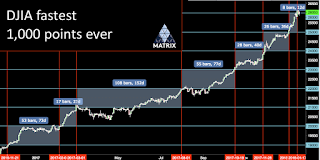 As we mentioned last week, SPX closed the longest ever run without a 5% correction both in time (397 days) and distance (41.15$), notably with both records being completed on the same day. Following the 3bp rise of the US 2-year note to a nine-year high (and a matching 3bp rise in the 10-year note which we track), the dollar had its best day since Oct 26th, with DXY putting on 48c (0.53%), with EUR, JPY and Gold sharply down, despite the Eurozone CPI beat at 1000. The only exception was GBP which continued to rally in the absence of any bad Brexit news, touching $1.39 briefly before falling back to end the day only slightly up, as was AUD. At 1500, The BoC raised rates to 1.25% as expected, but this was clearly priced in. The price action was unusual. There was an instantaneous 40 pip (0.33%) spike up, then followed by a huge 169 pip (1.37%) move down, all in a minute. The market then retraced all but 10 pips of that move over three hours, and then slowly moved back to where it started to end the day flat. Oil was up recovering some of Tuesday’s losses. 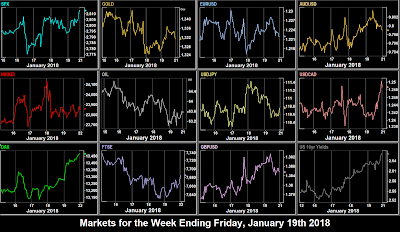 Despite the China GDP beat at 0200, Thursday was another down day for equities in this see-saw week, as the shutdown grew closer, with only DAX up, reacting to the previous day’s downturn in EUR. Bond yields up were 4bp, the highest since March, and Gold was down, but this didn’t help DXY, which posted another red candle, down against all major currencies. Oil was also down on the day, retreating further from Monday’s high. 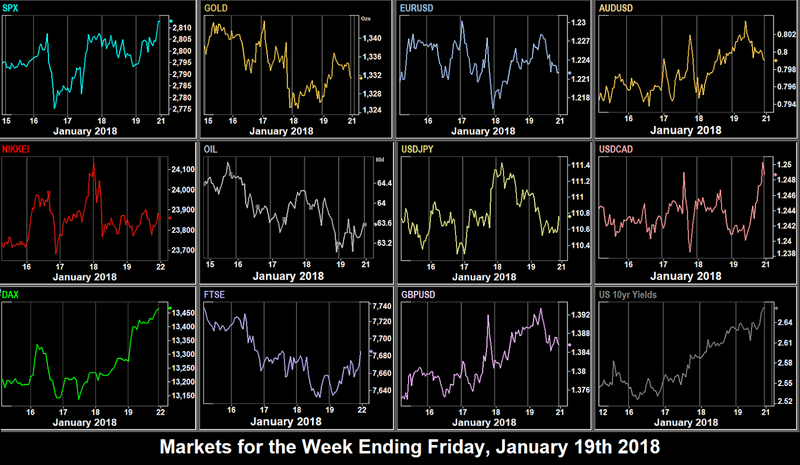 The theme of the week continued on Friday, SPX changed direction again and closed at another all-time high, completely disregarding the government shutdown. FTSE also had its first green day of the week, as GBP retreated from $1.39, and Oil turned back up. DAX had its best day since Oct 26th (the same day as Wednesday’s previous dollar record), putting on just over 1% to make a two-month high. Only NKY was down on the day as JPY recovered. It was another good day for bond yields and USD. Yields posted another three year high, closing at 2.664%. DXY was up again, although still posting its fifth down week in a row. CAD fell particularly sharply, giving up 95 pips (0.77%) finally picking up on the Oil slide, and from comments from the Russian Oil Minister that the price was unlikely to exceed $60 medium-term. EUR, GBP and AUD (along with Gold) were down. Oil duly slid as well. Only JPY managed gains against the dollar. These are the prices movements for the week on the instruments we cover, with USD pulling back for a sixth week. As last week, the only currency to recede against the dollar was CAD, so the best forex trade would have been to buy GBPCAD, up 1.06%. The top index and overall performer was DAX. As of Saturday morning, Bitcoin was down 7.4%, at $12,650, after a very bad week where it fell 33% at one point to just above $9,000. The US Government Shutdown has happened this weekend, and will undoubtedly be a factor in the markets next week, although the impact should not be serious, as shown in our fractal. On Sunday, Germany’s SPD will vote on whether to enter formal coalition talks with Angela Merkel’s CDU/CSU, and the next round of NAFTA talks starts early. We are also now seriously into the Q4/17 earning calendar. Monday is light on data, and we expect most talk to be around the shutdown and NAFTA. Netflix report earnings after the bell. Tuesday sees the BoJ rate decision. A hold is expected, but traders will be looking for further hawkish comments following the recent tightening decision. The Davos conference starts in Switzerland, and Canadian PM Trudeau speaks at 1030. There are no significant US news releases. Wednesday has a raft of PMIs, with Markit reporting Manufacturing and Services on the same day for Germany and the US. Also of interest are UK average earnings, the failure of which to grow has been a drag on interest rates. A miss here could push the overbought pound down quite sharply. South African inflation is released at 0800. Thursday has a raft of speakers in Davos: Christine Lagarde, head of the IMF; US TreasSec Mnuchin, UK PM Theresa May, and an interesting appearance from US economist Robert Shiller (he of the Cyclically Adjusted PE Ratio) in a session called “The Crypto Asset Bubble”. Elsewhere in Europe it’s a big day with the ECB Rate Decision at 1245 but more importantly the press conference at 1330, where traders will be watching Presidential Draghi for remarks about whether QE will definitely end in September 2018, and even if he reconciles the fact that the ECB thought EUR was high at 1.20 last September, but hasn’t commented on the fact that it stands around 1.22 now. Canadian Retail Sales are reported at 1330. The estimate is very low, and a beat could show a renewed bout of volatility. The Brazil market is closed. Friday opens with President Trump’s special address at 0700 in Davos, although no surprises are expected, and it is thought the theme will just be more ‘America First’ rhetoric. The main data highlight is US GDP/PCE, but Canadian CPI, issued at the same time produces another USDCAD volatility point. The first round of the Czech elections is held. Markets are closed in Australia (Australia Day) and India (Republic Day).